Have you been wondering about the TWIN badge over there in my sidebar? No? Well, hang on, because I’m going to tell you about it anyway. 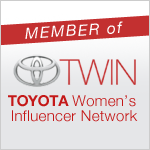 My friends at Clever Girls Collective got me a gig blogging for Toyota. So far an unpaid gig (thus the disclosure at the bottom of the post) but I live in hope that one of these days, if I write enough posts, a car carrier will pull up in front of my house and drop off a shiny new 4-Runner. Until then, I get to do fun stuff like go to Toyota camp, where I will learn to knit seat belts and get to carve tires out of solid blocks of rubber. We’re also going to learn those great old campfire songs like “The RAVs go Marching Two By Two,” and “Does Your Yaris Hang Low?” I’m hoping stunt driving will be on the schedule, because I really want a merit badge! (No, really, I have no idea what we will be doing at Camp Toyota. And I’m fairly sure their attorneys would tell you that no Toyotas will be sold with hand-knitted seat belts. Can you tell I work with an expert legal staff every day? Bless their detail-oriented little hearts). Stay tuned for more valuable information from The Greatest Automotive Manufacturer on Earth, whose cars you really should be driving if you know what’s good for you and if you want to be my friend. No, honestly, this should be fun. And I’ll take you for a drive in my RAV4 when it arrives. Forget The Visible Man…when I was growing up I had The Visible Engine. Much cooler, and a lot more appropriate, right? The visible engine sounds cool. And also as if it doesn’t have blue and red veins/arteries running throughout, which is the part that made me oogy. You may have to wait for that shotgun ride, but sure, ok.
I’m pretty skeptical about plug-ins, but my boss loves his Nissan Leaf. To me, just because they don’t make tailpipe pollution doesn’t mean they don’t make pollution – producing electricity and then shipping it causes a lot of lost efficiency. So maybe I can discuss at Toyota camp, between hikes and canoe races. I charged my rental Leaf at a charging station near where I work in Santa Monica that is an all-solar charging station. It felt like a good choice to me! See comment below why I stopped charging it at home. We currently have a Camry and have really liked it. I must admit, I adored my Passat, aka George, but he had to go to the car doctor more than one would like. So basically, we’re looking at another Toyota some time in the next year. I so would love a Hybrid, but I’m for whatever reason a bit skittish until more Camry Hybrids have been produced. I want to drive all the Toyotas. When I was car shopping the first time, I tried the Yaris and the Matrix, but didn’t like the Yaris and the Matrix got edged by the Honda Fit. Then after the Fit got destroyed, it was right after the tsunami/earthquake and there were few Toyotas to be had, so I didn’t get the chance to even test drive one. We are a TTH–Two Toyota Household. And both are hybrids. I drive a 2007 Toyota Highlander Hybrid, and my husband drives a 2010 Toyota Prius. We love both. I live in NE Ohio, the Rust Belt and smack dab in Car Country. I tried like hell to buy an American car, but I refused to buy anything but a hybrid. I had decided to be part of The Solution in all of my consumer choices. There were none available when we first went hybrid shopping. NONE. The best anyone could do for us for a hybrid SUV was to order one, which we would have had to buy, sight unseen and without a test drive. All the hybrids were on the right and left coasts. I was devastated, but I had to make my peace with it and decide on behalf of The Greater Good. I bought the Toyota Highlander hybrid and have never looked back. It made our second car buy a lot easier. I’m happy with the Honda Fit. That said, we’d been driving American cars for a long time – Ford products. We had a Fusion hybrid that we loved, but due to rodent damage to the wires it burned up last summer. It literally caught on fire in our carport and if it weren’t for the quick response of LA County Fire, we would have lost out house. Rented a Toyota Prius and a Nissan Leaf for a couple of weeks. I loved the Leaf. But living in a rodent-prone area, it’s a tough issue. Charging electric cars make warm cozy homes for rats at night – the very first night I plugged it in, the next morning I found a rat had started a nest inside it. And though Hybrids are not inherently dangerous or more susceptible to rodent damage than other cars – since they have a high-voltage system, when rats DO eat their wires, the resulting damage can be more dangerous. So now we both drive Honda Fits. Good car, good mileage, and if the rats eat the wires, it’s just a 12-volt system. I’m a huge fan of Toyota, myself…. and I totally lust after those Sequoias. If I had a couple kids, I’d LOVE the Sequoia. Toss them in back, fire up the DVD player…yeah. If my seatbelt were hand knitted by you, I’d feel safe. I bet you’ve never received a finer compliment. Me knitting is probably a bad idea. Thank goodness for air bags. I’d take a seatbelt knitted by you, too. You’d lovingly craft it to save my life and I trust you. Also, how cool is it that we’re both working with Toyota in different ways? COOL, I say. I can’t wait to hear what you have to say about your camping! You obvs have NO idea of what a terrible crafter I am!